Where do we begin to change the cynicism and negativity we bring into our families, workplaces, and churches? People were everywhere. They had crowded in to hear the voice of God thunder out from the wild man in the wilderness who spoke God's truth with clarity unheard since the times of Elijah and Elisha. As his voice traveled down the lush twists and turns of the Jordan River, his message breathed into flame the ember of something holy and expectant in the hearts of men and women from all over Galilee, Judea, and Decapolis. Soldiers, tax collectors, prostitutes came, were convicted in their hearts of their sin, and were plunged beneath the water to begin life with a fresh commitment to God. Moms and dads, shopkeepers and leatherworkers, fisherman and zealots, people whose hopes were crushed and people whose hopes were on fire looking for the Messiah all came to hear God's challenging message of repentance and to be baptized by John. Suddenly, everything stopped. At this moment, it seemed as if everything stood still and heaven's spotlight focused on this moment and place. Jesus stepped forward to be baptized. Mud squished between his toes as he stepped down into the river and all of heaven watched breathlessly as the Savior came to honor the Father and identify with the people he came to save. "I can't do this," John the Baptizer told Jesus. "I am not worthy to do this. I need to be baptized by you, not me to baptize you!" "It must be so to fulfill the righteous plan of God, my Father," Jesus told his cousin. When all the people were being baptized, Jesus was baptized too. 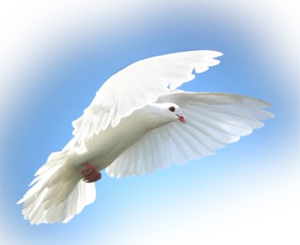 And as he was praying, heaven was opened and the Holy Spirit descended on him in bodily form like a dove. And a voice came from heaven: "You are my Son, whom I love; with you I am well pleased" (Luke 3:21-22 NIV). This event is pivotal on many levels. 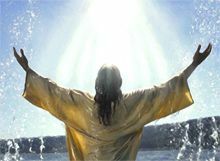 Jesus' baptism is the signal of the beginning of his ministry as well as his coronation as King of Israel and Son of God. The long wait for the Messiah to show himself is over. The Savior is ready to begin his work of redeeming the lost world by becoming a ransom for all those who would choose to follow him. But underneath the importance of the moment, often hidden in the great theological and messianic implications of this moment, is something precious and very human. Something we must not miss and we must also put into practice. The Father affirms his relationship with the Son: "You are my son!" The Father affirms his pleasure with the Son: "With you I am well pleased!" The mystery of Jesus' identity is hard to cram into our human brains. Jesus is fully God and fully human. Jesus is divine and mortal. All at the same time in the same person. Sometimes, we let the divinity of Jesus hide the humanity of God's Son. So we must not miss the powerful example that God gives us to show us what we all need most from those we love. Jesus leaves his baptism to go face temptation for forty days in the desert as the Son prepares himself for the work of God that lies ahead of him. And what are the first words out of the mouth of the evil one, the father of lies? "If you are the Son of God..." (Luke 4:3). Think about this a moment. Let the truth of this wash over you. "If you are the Son of God..." are the very first words out of the mouth of the deceiver. Do you really think it is an accident, simply a happy coincidence, what the Father had just told the Son? "You are my Son. My beloved. With you I am well pleased." Jesus goes to face his time of testing in the desert with the affirmation of the Father's claim of relationship ("You are my Son.") ringing in his ears and embedded in his heart. Jesus will do battle with the evil one and resist the temptations not just because he knows the Scriptures better than Satan, but also because he knows the Father loves him and is pleased with him. So here is my point for us. If God prepared his Son to face his battles with the devil by affirming his relationship with Jesus, his love for Jesus, and his pleasure in Jesus, don't we need to do the same for each other in God's family? As we look at building a culture of honor in our families, our organizations, our churches, and our communities, affirmation is the place to begin. How do I know this is the place we must begin? Because this is where God begins with Jesus in his ministry. Jesus began his move toward ministry with obedience to the Father, submission to the mission ahead, and identification with the people he would serve. He did this by being baptized. God immediately responded with the dramatic affirmation of the Son — the heavens were torn open and the Holy Spirit descended in bodily form like a dove. If God began there with the Son, we must begin there with each other. We live in a culture of cynicism and suspicion. We tear down others to bring them down to our level. We delight in the morsels of negative gossip about celebrities, politicians, and sports stars. Our desire for these juicy tidbits about others' failure and flaws is insatiable. So we train ourselves to look for the negative in others. To look at the goodness in others with cynical suspicion, assuming there is also some dark and depraved other side to their personalities we haven't discovered yet. We're going to have to start with affirmation. We carry these suspicions with us into God's family, the church. We have been trained to be suspicious and look for flaws, so it is not hard for us to find them. The problem with our church families is simple: everyone there is a sinner with flaws and inconsistencies... just like us. However, there is another truth we must not forget. Our church families are full of precious people who long to be more than we are now. We want help in being transformed into the character and compassion of Jesus that the Holy Spirit is working in us to become (2 Corinthians 3:18). What we need is an environment that encourages us toward that goal, not one that drags us back to our flaws, inconsistencies and failures. We long for a culture of honor to help us grow, live, and flourish. The place to begin is where God began with Jesus: affirmation — affirmation of relationship, love, and pleasure. I am writing to God's church in Corinth, to you who have been called by God to be his own holy people. He made you holy by means of Christ Jesus, just as he did for all people everywhere who call on the name of our Lord Jesus Christ, their Lord and ours.May God our Father and the Lord Jesus Christ give you grace and peace.I always thank my God for you and for the gracious gifts he has given you, now that you belong to Christ Jesus (1 Corinthians 1:2-4 NLT). Paul isn't buttering them to bring the hammer down on them later. Paul is genuinely affirming who they are, what God is doing with them, and how precious they are to him. All this is given to a church that was as big a mess as we could ever discover. Affirmation is what we need before we receive correction and before we face the attacks of the evil one! When we go to all of Paul's letters, but one, we find this same kind of affirmation. The one that's lacking the affirmation at the beginning? Galatians — the church caught up in "devouring one another" (Galatians 5:15). Why are they devouring each other? Because they were devoid of grace and had forgotten that affirmation is essential to building a culture that honors each other and God! There are few gifts more important to give than the gift of affirmation. 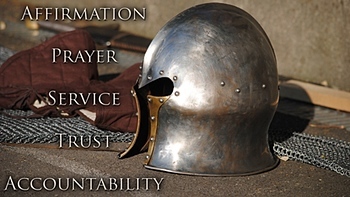 And if we are going to build a culture of honor, it's the place we must begin! "Building a Culture of Honor: Affirmation" by Phil Ware is licensed under a Creative Commons License. Heartlight encourages you to share this material with others in church bulletins, personal emails, and other non-commercial uses. Please see our Usage Guidelines for more information.